How to do this in 6502/6510/8502 Assembly Language! Here’s part two of my experiences so far with my new/old Commodore 128! I feel I should point out first of all that, unlike TMR has recently claimed, when I bought a Commodore 64 in 1984 it wasn’t well known that it had crap, “Neanderthal”, or standard PET BASIC with no commands for colour, graphics, or sound. I only found this out from reading C64 magazines and the course “An Introduction to BASIC”. I think they should have had a warning sticker on them! In John Lewis, Oxford St, London, In 1984 or 1985, where at least their sign warned people that the Commodore 64 had only 38K (i.e. that they could actually use in their BASIC programs), I once inputted and ran a print loop on a C64 saying “BASIC V2 WARNING! THE LATEST VERSION IS 4.5.”, which was referring to the latest version of Microsoft BASIC on MSX computers, that were on display there at the time. An important victory of mine recently is managing to add two contradictions to the Commodore 64 propaganda on its Wikipedia page backed up by quotes from sources, and not having them deleted. See if you can spot them. I hope you enjoy it! Now back to the Commodore 128. 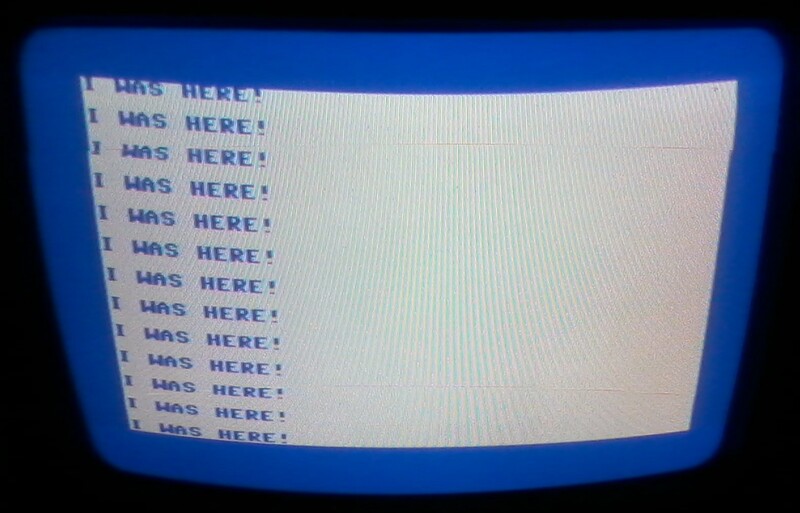 Below is a listing of my Assembly Language program which prints “I WAS HERE!” and scrolls vertically, but first of all I must tell you how to type it into the C128 MONITOR. You must start by finding a safe place to put your program, which for some reason is $1800 on the C128, although this may not be safe on earlier Commodore computers. 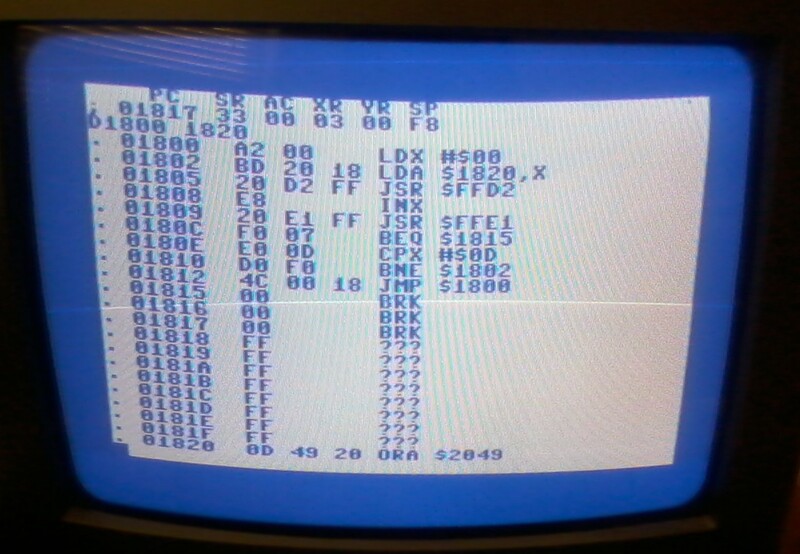 Some safe addresses on the C64 are $1000 or 4096 in decimal and $C000 or 49152 in decimal, where there’s 4K of space. Based on my attempts, it seems that the C128 doesn’t like Assembly Language/Machine Code programs to start at $C000, though. It exits the MONITOR to BASIC and prints ?SYNTAX ERROR. This seems to be because the RAM starting at $C000 49152 is the BASIC screen editor, which is somehow better than the Commodore 64. You can stop the cursor from flashing by pressing ESC followed by E, as well as some other editing commands which may have been copied from CP/M, or the Spectrum 128K. You just type MONITOR, followed by A1800 to Assemble starting at the address $1800, then press SPACE and input the first line, as listed below, leaving one space between the opcodes and the numbers. After this, you press the RETURN key, which will allow you to type in the next line. You continue like this until after inputting the final instruction, which is BRK. After typing BRK you press the RETURN key as usual, then press it again to let the MONITOR know that’s the end of your program. You should eventually have the following program, which I’ll explain in a moment. It seems this program doesn’t run on a C64, or would need to be relocated to run. I could only get it to LOAD when using the C128 in C64 mode. You can check what you’ve typed by giving the command D1800. If there are any errors you can correct them by typing A, followed by the address of the line where they are, then retyping that whole line. We also need some data for this program to work with. When it comes to inputting data instead of Assembly Language instructions, different assemblers have different ways of doing it. I think these are called directives. Luckily, in this case, we’re using the standard Commodore MONITOR for the C128, but which dates back to the PET. This is fine when it comes to an old fashioned MONITOR with an Assembler, because you can access any part of the computer with it, but obviously not fine when it comes to an old version of BASIC. I think this MONITOR includes what Your 64 magazine called a “simple Assembler”, meaning that you just input Assembly Language and each line is assembled when you press RETURN, instead of typing source code into a text editor. To save your program to disk, all you need do is replace the number 1 following the filename with the number 8, the same as with Commodore BASIC V2. What do these 6502 Assembly Language instructions actually mean and what do they do? Surely it can’t be that complicated, because there aren’t many of them. The 6502 CPU, as well as compatible processors such as the 6510, 8502, etc hasn’t got many registers. All it has are the accumulator (A), Stack Pointer (SP), Program Counter (PC), X index register, Y index register, Status Register (P), and that’s ALL! Due to the low number of registers, 6502 Assembly Language often uses the instruction STA $address meaning store the contents of the Accumulator or A register in the following memory location, although the Z80 CPU would copy it into one of its other registers. LDA means LoaD Accumulator with the following number, LDX is LoaD X register with the following number. Here’s a list of all these instructions. Unfortunately the program as listed above takes over the C128, disabling the RUN STOP key. To re enable this key, you need to add the following instructions. I think that’s enough for now. Just go over the contents of this post and look forward to reading my next post about the Commodore 128, which is coming up very soon! « THE COMMODORE 128: THE FIXED AND UPGRADED COMMODORE 64! TMR is a C64 supporter who writes the blog “C64 Crap Debunk” on https://c64crapdebunk.wordpress.com/ . The initials TMR stand for The Magic Roundabout, a classic kids’ TV show. He’s a C64 programmer and a mathematical genius, who it seems learnt to program on the much simpler, but largely C64 compatible Commodore VIC.20 computer, which uses the same Commodore BASIC V2 as the C64, although most addresses to PEEK and POKE are different. 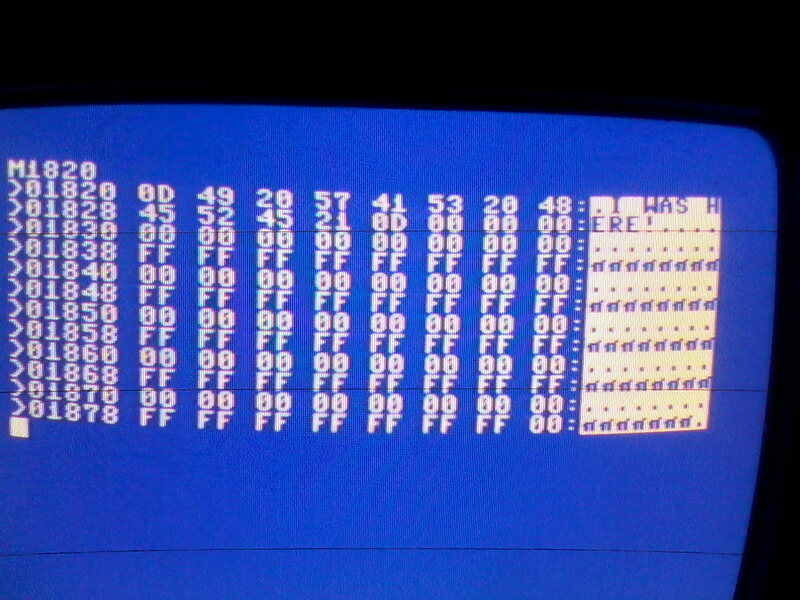 It has a ROM containing the Commodore Kernel routines, which are more or less compatible with the C64 and all other Commodore 8 bit computers. TMR has been promoting my blog by criticising it, as explained on https://commodore64crap.wordpress.com/2013/01/09/good-news-from-wordpress-thanks-tmr/ , but he doesn’t think that’s what he’s doing. I mention TMR a lot on this blog, but these mentions are usually accompanied by links. Unfortunately, in this post I forgot to include a link. I advise you to read all the other posts on my blog, starting at the bottom of the page https://commodore64crap.wordpress.com/2012/08/ . As for why I have so many visitors, it's probably because I tell it like it is, trying to uncover the mysteries that Commodore created surrounding the C64. This was thanks to their BASIC, as well as their crappy manuals!